Vancouver, BC - Skyharbour Resources Ltd. (TSX-V: SYH) (OTC Grey: SYHBF) (“Skyharbour”) is pleased to provide an update on the exploration activities at the Western Athabasca Syndicates’ 246,643 hectare (609,469 acre) Preston Lake Property located south of Fission Uranium (TSX-V: FCU) and Alpha Minerals’ (TSX-V: AMW) nearby Patterson Lake South (“PLS”) high-grade discovery. The Western Athabasca Syndicate consists of Skyharbour, Athabasca Nuclear Corp. (TSX-V: ASC), Noka Resources Inc. (TSX-V: NX) and Lucky Strike Resources Ltd. (TSX-V: LKY) (“the Syndicate”). The Syndicate is very encouraged with the recently completed first-pass ground program (see September 5, 2013 news release) and has rushed sample geochemical results as the next planned phase of follow-up field work commences. Recent fieldwork focused on the evaluation of fourteen high-priority targets identified by the Syndicate’s Technical Committee using an advanced targeting matrix. Targets have been prioritized based on a detailed criteria set consisting of similar geological features and exploratory indicators present at Fission Uranium and Alpha Minerals’ nearby Patterson PLS discovery. Targeting matrix components included preliminary data from the 2013 VTEM plus and radiometric airborne surveys. 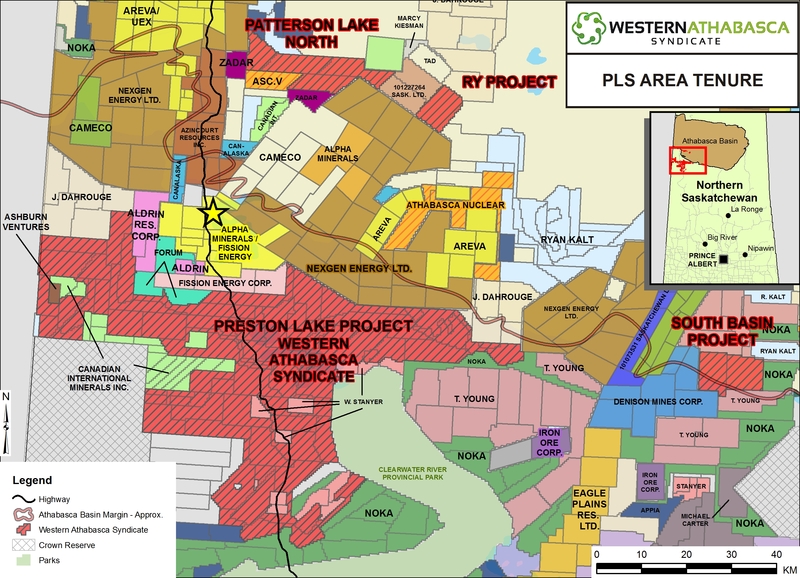 The VTEM plus survey has mapped over 300 kilometres of graphitic-type conductor segments, some approaching 10 kilometres in length, in the eastern blocks of the Preston Lake property. Basement geological trends in the furthest western block are oriented NW-SE, while those in the eastern blocks are W-SW to E-NE which is similar to Fission and Alpha’s PLS high-grade uranium discovery area. Cross-cutting structural features and flexures affecting the conductor traces, which are often associated with the high-grade uranium deposits of the Athabasca Basin, including the PLS discovery, are of particular interest. Initial interpretation of the radiometric data has identified areas with elevated uranium counts that can be correlated along and between multiple lines which may indicate the presence of radioactive boulder trains or in situ uranium mineralization. These radiometric features, particularly where possible source areas coincide with prospective EM conductors, are high-priority targets for follow-up ground work as this is the signature that led to the PLS discovery. Management cautions that past results or discoveries on proximate land are not necessarily indicative of the results that may be achieved on the Western Athabasca Syndicate Project. This first-pass phase of ground exploration included boulder prospecting using hand held scintillometers, radon and silt sampling using both helicopter and boat support, geochemical and radon soil sampling, geological mapping and prospecting, and biogeochemical sampling. The Syndicate is employing a systematic, proven and cost-efficient exploration methodology that has led to numerous uranium discoveries in the region and throughout the Athabasca Basin. A total of 217 km of scintillometer surveying was completed in areas of interest identified by the radiometric survey. The field team utilized a float equipped helicopter to collect water samples for radon analyses and lake sediment samples for geochemical analyses. This technique proved to be expeditious and highly effective with 291 water and 248 lake sediments collected. Additionally, 213 biogeochemical samples and 91 soil geochemical samples were collected from detailed grids established over priority targets as well as 21 rock samples. Final results, including rushed-assays, are still pending from this phase of work and will be reported when received. Highly encouraging initial findings from the first-pass ground work have prompted the commencement of the next phase of field work. This phase of exploration will include focus on specific high-priority areas identified from the work to date. By the end of this summer’s field program in October, a total of approximately $1.5 million will have been spent in exploration on the project between airborne geophysical surveys and follow-up ground work. The goal of this summer’s exploration program is to identify uranium showings and potential drill targets through detailed geophysical surveys, elevated silt and soil samples, radon anomalies and radioactive boulder fields as was the case at the nearby PLS discovery.